You may be looking for Served and not even know it! 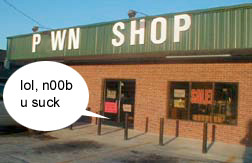 The humble Pwn Shop, where it all began. Pwned, also typed as Pwnd or Pwnd! is a phrase accidentally made up by a young child playing online world of warcraft who had just defeated an army of over 100 others and was attempting to describe to them what he had just done. 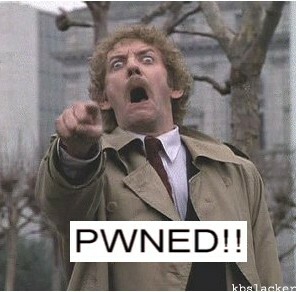 Many people mistook Pwned for a real word although the child was in reality reaching for the "O" and instead found the "P"
Pwned according to defintions should be used when Owned just isn't strong enough. For example if you were kicked in the balls you were Owned. Now say instead of getting kicked in the balls with just an ordinary shoe, there were spikes on it and instead of it just hurting they were actually torn open, now you have been PWNED! See above that the word "SHOULD" is used and not "WILL" the reason for this is that we are not gurateeing that you will be okay. If you have been PWNED this is a very serious, non-laughing matter. Pretend you didn't hear the word at all. If you've been obviously PWNED, and you can't pretend to not hear it hang your head in shame and immediately walk towards the nearest dark place. To come back from being PWNED you will need to do something Super awesome, like invent the internet-- which incase you wondered you cannot do because it has already been done. 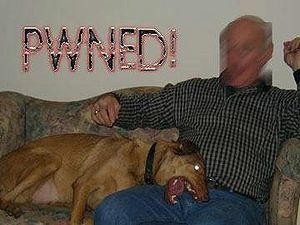 After someone is kicked in the nuts, it is traditional to yell "Pwned!!". Edit:There is only one way to prevent being laughed at post-pwned. Get Laid. None of your friends have scored on anything but that FPS or RPG you play in your bedroom with the curtains closed. If you have a female/male then your friends will bow down to you and you will technically pwn them in the real world. The Queen famous for pwning French president Nicolas Sarkozy at WWE Smackdown 2008 during his recent state visit to the UK.